The good news is that most will consider installing hardwood floors easier than installing carpet because the pieces are easier to assemble than cutting carpet and making the seams fit. While installing hardwood floors can appear easier, it’s still very important to do it right to avoid flooring issues later down the road. Follow this article for tips and advice on how to install hardwood flooring in your home. Prior to installation, clean the subfloor and remove any old pieces of glue, tacks, or anything else that may get in the way of providing a clean, flat surface for your new floor. If need be, lay down tarpaper and nail it into place with a staple gun. Tarpaper acts as a moisture retardant and helps add to the longevity of your floor. 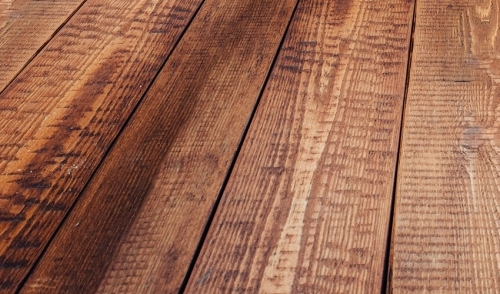 A common sin when installing hardwood floors is not checking for moisture. Moisture is hands-down the number one cause of wood flooring problems in homes. One way to avoid this common issue is taking the proper steps during installation to make sure the surface area of the floor is moisture free and the interior climate is not going to have an affect on the floor in the coming months. When installing your floor, always remember that wood is a natural material. It will swell and shrink as it gains and loses moisture with the seasons, which means some gaps are normal. However, if the gap is significant in size, then you know the installation of the floor fell short and needs to be repaired. Once your sub floor and environment are in good shape, its time to lay the wood. Start with the straightest and longest planks along the wall with the tongue facing the center of the room. Place spaces within the expansion gap so the wood can have a little space for expansion from heat and humidity. Try to mix the boards up from each box to ensure the finished product is a good mix of color without any weird patterns or patchiness. When putting the pieces in place utilize blind-nailing to conceal the nails holding the boards in place. This is highly recommended and widely used for tongue-and-groove flooring. When using this method, it’s important to drive the nail slightly below the surface of the wood to prevent interference in the joints and seems of the planks. Take your time and work your way across the room. On the final row you may have to cut planks lengthwise to fit the room. Use a block and pry-bar to wedge the last boards into place. Face-nail it into place and use glue for extra support. After the base layer is set in place, remove spacers and reattached any baseboards or moldings that were removed in the process. Give the floor another 24 hours to expand and contract freely. Installing a hardwood floor is fun and much like putting a big puzzle together. Don’t rush and take your time with each piece down to each board and each nail used in the process. I guarantee you will be happy with the outcome for years to come.